Properties in Moncucca average 4.3 out of 5 stars. 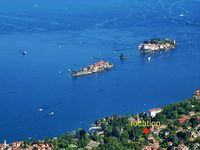 Spacious holiday house with garden and beautiful views of Lake Maggiore. Property 17: Spacious holiday house with garden and beautiful views of Lake Maggiore. Quaint gem in a unique Panormalage on Lake Maggiore! Property 34: Quaint gem in a unique Panormalage on Lake Maggiore! Very nice, spacious, airy house with great view of Laveno and the lake. 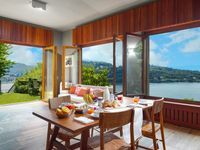 Four adults and two children felt very comfortable in this spacious, nicely modern villa. Everybody loved the terrace, and played lots of table football. The large windows, the upstairs balcony, and the terrace afford a lovely view of the lake, and of the passing ferries. There is no beach in the immediate vicinity, but it only takes a short drive to the nearest one, which also has a good restaurant. There are plenty of bathrooms, and everybody enjoyed their separate bedrooms. The kitchen is well appointed, but lacked basic spices such as sugar and salt - surely the management could afford to leave some there for new arrivals. Laveno is only walking distance away, though carrying groceries on a hot day isnot recommended. Our only complaint is the absurd check-in procedure: it requires that guests drive to an obscure tiny village some 10 km away, and locate an obscure address, in order to do paperwork that could just as well be completed at the villa, since a manager has to open up the villa anyway. This check-in procedure was ridiculously unncecessary and very annoying after a long day of travelling.